Herodotus and Pliny report that labdanum was collected by combing the beards of goats, which were impregnated with the substance. 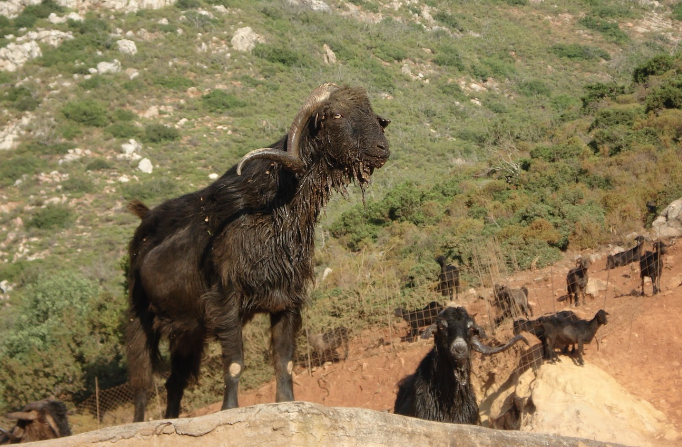 The goats graze from the branches [of the cistus shrubs] and the sticky resin gets stuck on their beards. Upon their return, their owners comb...their beards and extract the resin. Wikipedia says this same sticky goat hair was used to make the false beards once worn by Egyptian pharaohs. We can imagine then, that their beards may have had a "sweet, herbaceous, balsamic odor, with a rich amber undertone found in few other essences," according to Mandy Aftel's notes on labdanum, or, back to Perfume Shrine, may have smelled "balsamlike, with woody, earthy, smoky, and even marshy undertones. Some even describe [labdanum] as ambergris-like, or leathery and honeylike with hints of plum or oakmoss after a rain." I think it would be good to have two goats and a yard. Resin is a really great word. Do words have a smell? I remember saying to myself, upon reading of a particular perfume's ingredients, that I would love labdanum because it sounded good. Which is sort of like something smelling good, isn't it? Labdanum. Labdanum. Labdanum. Smells and sounds incredible. And resin! Another good word that happens to smell pretty great, albeit a little strange. "The long ‘a’ of the English alphabet . . . has for me the tint of weathered wood, but a French 'a' evokes polished ebony. This black group also includes hard ‘g’ (vulcanized rubber) and ‘r’ (a sooty rag being ripped). Oatmeal ‘n’, noodle-limp ‘l’, and the ivory-backed hand-mirror of ‘o’ take care of the white. . . . Passing on to the blue group, there is steely ‘x’, thundercloud ‘z’ and huckleberry ‘h’. Since a subtle interaction exists between sound and shape, I see ‘q’ as browner than ‘k’, while ‘s’ is not the light blue of ‘c’, but a curious mixture of azure and mother-of-pearl." ~Vladimir Nabokov, "Speak Memory"
Seeing the unfamiliar word labdanum evoked a medicinal odor memory for me because it is so close to laudanum. I agree that resin is cool, as is its cousin rosin, needed for playing the violin. I have a cousin named Robin. Cousins are fantastic. Is your cousin the same redheaded Robin that I know, Anonymous? Either way, nice wordplay, resin, rosin, Robin. This week's nosy interviewee mentions the smell of rosining a cello bow in her interview. Sounds like it smells lovely.